Typical cake ingredients are flour, sugar, eggs, butter or oil or margarine, a liquid, and leavening agents, such as baking soda or baking powder. Common additional ingredients and flavourings include dried, candied, or fresh fruit, nuts, cocoa, and extracts such as vanilla, with numerous substitutions for the primary ingredients. 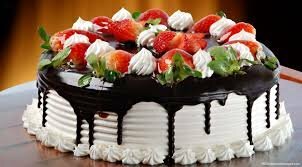 Cakes can also be filled with fruit preserves,nuts or dessert sauces (like pastry cream), iced with buttercream or other icings, and decorated with marzipan, piped borders, or candied fruit. Hi, vrushali15! I just resteemed your post!